DE-964 driver education certificate is issued by course providers approved by the Texas Department of Licensing and Regulation after a student completes the parent taught drivers education course. Some course providers mail the certificate after course completion. At Virtual Drive, we make the student’s DE-964 certificate digitally available in the student’s course login. This makes it easy for the student to print the certificate to bring to their local DPS office. Your DE-964 certificate is vitally important. A copy must be presented to the DPS office when your student is applying for their Texas provisional drivers license, as proof of having completed an approved parent taught driver education course. Make additional copies of your DE-964 certificate. At least one to keep for your records, and a second copy to provide your insurance company or agent, as most insurance companies will provide up to a 10% discount for completing an approved driver education course. 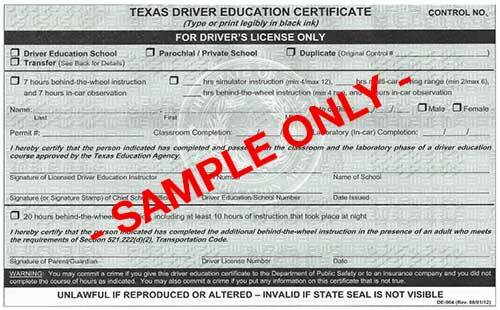 If you have lost your DE-964 certificate and need a replacement, contact your driver education course provider. By law, approved course providers are required to keep records for a number of years, so you may be able to get a replacement copy from your driver education course provider.